With ten multi-platinum albums and sixteen Top 30 hits, Foreigner is universally hailed as one of the most popular rock acts in the world with a formidable musical arsenal that continues to propel sold-out tours and album sales, now exceeding 75 million. Responsible for some of rock and roll’s most enduring anthems including “Juke Box Hero,” “Feels Like The First Time,” “Urgent,” “Head Games,” “Hot Blooded,” “Cold As Ice,” “Dirty White Boy,” “Waiting For A Girl Like You,” and the worldwide #1 hit, “I Want To Know What Love Is,” Foreigner continues to rock the charts almost 40 years into the game. Mick also brought in bassist Jeff Pilson, multi-instrumentalist Tom Gimbel, guitarist Bruce Watson, Michael Bluestein on keyboards, and Chris Frazier on drums. An unprecedented new level of energy lead the group to a re-emergence of astounding music that speaks to long time Foreigner fans and younger generations. With renewed vitality and direction, Foreigner hit the Billboard® charts again with the 2005 release of their live greatest hits album, Extended Versions. Can’t Slow Down followed in 2009 and entered the Billboard® chart in the Top 30, driven by two Top 20 radio singles, “In Pieces” and “When It Comes To Love.” To follow was the release of the band’s 3-disc set, Feels Like The First Time, which included an acoustic CD with an intimate and unique re-interpretation of many Foreigner classics, studio re-records by the new lineup and a live performance DVD showcasing the group’s exceptional live energy. Foreigner experienced another surge in popularity when several of their hits were featured on the Rock of Ages soundtrack, including “I Want To Know What Love Is,” “Juke Box Hero” and “Waiting For A Girl Like You” – more songs than any other one band on the soundtrack. Hollywood quickly took note, and several more tracks were featured in hit films “Anchorman 2,” “Magic Mike” and “Pitch Perfect,” sending Foreigner downloads up 400%. The video game industry was soon to follow with the blockbuster release, “Grand Theft Auto V”. Downloads continued to soar after their worldwide #1 hit “I Want To Know What Love Is” was featured as the 2015 season finale end title of “Orange Is The New Black.” Foreigner hits have also recently been included in such primetime TV shows as “The Late Show with Stephen Colbert" and “The Tonight Show with Jimmy Fallon,” among others. Hot Blooded is on the trailer for the Angry Birds movie and has been streamed more than 6 million times. The high visibility of Foreigner’s songs continues to introduce the band’s music to a whole future generation of fans, exemplified by Jack Black’s version of “Juke Box Hero” in Kung Fu Panda 3. In June 2013, Mick Jones was inducted to the Songwriters Hall Of Fame. A multi-talented and multi-dimensional “musician’s musician,” Jones has also written songs such as “Bad Love” with Eric Clapton and “Dreamer” with Ozzy Osbourne, and produced records for others including Billy Joel’s Storm Front and Van Halen’s 5150. A Grammy® and Golden Globe®-nominated songwriter, Jones is the winner of the prestigious British Ivor Novello Songwriter Award for “The Flame Still Burns”, the soundtrack music for the film Still Crazy. The year continued with Foreigner’s headline run in The Soundtrack of Summer US amphitheater tour. The hits compilation album of the same name was released to coincide with the tour and immediately hit the Billboard® Top 200 chart, peaking at #64. For most weeks during the tour, Juke Box Heroes joined The Soundtrack Of Summer in the Billboard® Top 200 making Foreigner the only Classic Rock band to have such a remarkable presence in today’s chart. Recent albums like Juke Box Heroes, a new compilation of digitally recorded Foreigner hits, and The Best of Foreigner 4 & More, recorded live from The Borgata, continue to chart, with Billboard® recently releasing their “Greatest of All Time” lists featuring Foreigner hits in every category. Catalog sales often eclipse those of AC/DC, Aerosmith, The Rolling Stones, Queen, Van Halen and most of their Classic Rock peers (Source: Nielsen SoundScan Top 200, September 15, 2013). Foreigner made headlines again in the summer of 2015 by joining mega act Kid Rock on his “Cheap Date: First Kiss Tour,” rocking amphitheatres and stadiums across the United States. One of the only heritage acts to commence a tour of this magnitude, Foreigner gained in legions of new fans as part of this legendary partnership. The year 2015 also brought Foreigner’s partnership with Ford’s Drive 4 UR School campaign, where Ford joined Foreigner’s successful high school choir promotion in several markets, donating funds and allowing winning choirs the chance to join Foreigner onstage. In February 2016, Foreigner released their first-ever live acoustic album In Concert. Unplugged. The band’s royalties will be donated to JDRF (Juvenile Diabetes Research Foundation) and the album is available exclusively via Amazon. 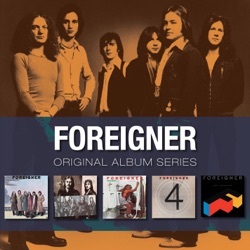 Foreigner recorded this unique acoustic album at a once-in-a-lifetime private concert hosted by Edsel B. Ford II on August 24, 2015 at the Ford Motor Company Conference & Event Center in Detroit, MI. Foreigner kicked off 2016 with a much hailed unplugged appearance on The Today Show on February 11th followed by a short run of New York area sold out acoustic shows culminating with an epic concert at The Lincoln Center as part of the acclaimed American Songbook Series.